The Associated Press reports carrying the news of Mary White's death declared that it came as the result of a fall from a horse. How she would have hooted at that! She never fell from a horse in her life. Horses have fallen on her and with her—"I'm always trying to hold 'em in my lap," she used to say. But she was proud of few things, and one of them was that she could ride anything that had four legs and hair. Her death resulted not from a fall but from a blow on the head which fractured her skull, and the blow came from the limb of an overhanging tree on the parking. The last hour of her life was typical of its happiness. She came home from a day's work at school, topped off by a hard grind with the copy on the High School Annual, and felt that a ride would refresh her. 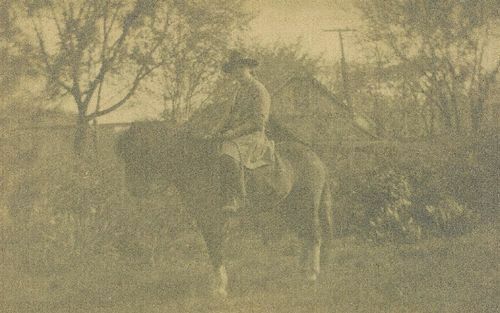 She climbed into her khakis, chattering to her mother about the work she was doing, and hurried to get her horse and be out on the dirt roads for the country air and the radiant green fields of spring. As she rode through the town on an easy gallop, she kept waving at passers-by. She knew everyone in town. For a decade the little figure in the long pigtail and the red hair ribbon has been familiar on the streets of Emporia, and she got in the way of speaking to those who nodded at her. She passed the Kerrs, walking the horse in front of the Normal Library, and waved at them; passed another friend a few hundred feet farther on, and waved at her. The horse was walking, and as she turned into North Merchant Street she took off her cowboy hat, and the horse swung into a lope. She passed the Tripletts and waved her cowboy hat at them, still moving gayly north on Merchant Street. A Gazette carrier passed—a High School boy friend—and she waved at him, but with her bridle hand; the horse veered quickly, plunged into the parking where the low-hanging limb faced her and, while she still looked back waving, the blow came. But she did not fall from the horse; she slipped off, dazed a bit, staggered, and fell in a faint. She never quite recovered consciousness. But she did not fall from the horse, neither was she riding fast. A year or so ago she used to go like the wind. But that habit was broken, and she used the horse to get into the open, to get fresh, hard exercise, and to work off a certain surplus energy that welled up in her and needed a physical outlet. The need has been in her heart for years. It was back of the impulse that kept the dauntless little brown-clad figure on the streets and country roads of the community and built into a strong, muscular body what had been a frail and sickly frame during the first years of her life. But the riding gave her more than a body. It released a gay and hardy soul. She was the happiest thing in the world. And she was happy because she was enlarging her horizon. She came to know all sorts and conditions of men; Charley O'Brien, the traffic cop, was one of her best friends. W. L. Holtz, the Latin teacher, was another. Tom O'Connor, farmer-politician, and the Rev. J. H. Rice, preacher and police judge, and Frank Beach, music master, were her special friends; and all the girls, black and white, above the track and below the track, in Pepville and Stringtown, were among her acquaintances. And she brought home riotous stories of her adventures. She loved to rollick; persiflage was her natural expression at home. Her humor was a continual bubble of joy. She seemed to think in hyperbole and metaphor. She was mischievous without malice, as full of faults as an old shoe. No angel was Mary White, but an easy girl to live with for she never nursed a grouch five minutes in her life. With all her eagerness for the out-of-doors, she loved books. On her table when she left her room were a book by Conrad, one by Galsworthy, "Creative Chemistry" by E. E. Slosson, and a Kipling book. She read Mark Twain, Dickens, and Kipling before she was ten—all of their writings. Wells and Arnold Bennett particularly amused and diverted her. 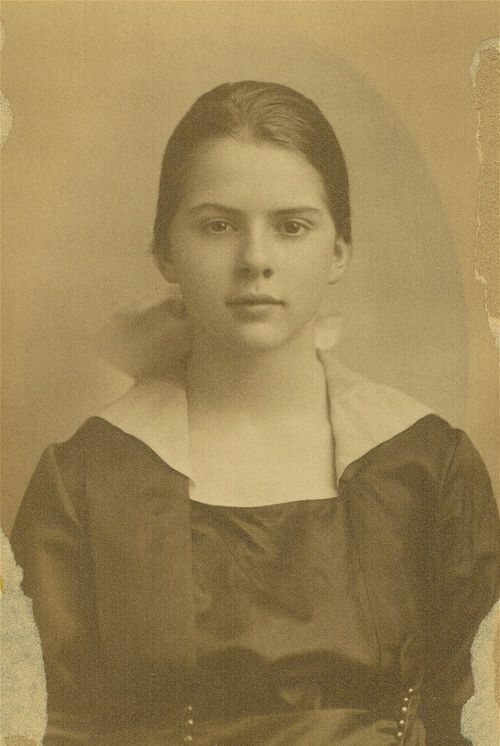 She was entered as a student in Wellesley for 1922; was assistant editor of the High School Annual this year, and in line for election to the editorship next year. She was a member of the executive committee of the High School Y.W.C.A. Within the last two years she had begun to be moved by an ambition to draw. She began as most children do by scribbling in her school books, funny pictures. She bought cartoon magazines and took a course—rather casually, naturally, for she was, after all, a child with no strong purposes—and this year she tasted the first fruits of success by having her pictures accepted by the High School Annual. But the thrill of delight she got when Mr. Ecord, of the Normal Annual, asked her to do the cartooning for that book this spring, was too beautiful for words. She fell to her work with all her enthusiastic heart. Her drawings were accepted, and her pride--always repressed by a lively sense of the ridiculous figure she was cutting--was a really gorgeous thing to see. No successful artist every drank a deeper draft of satisfaction than she took from the little fame her work was getting among her schoolfellows. In her glory, she almost forgot her horse—but never her car. For she used the car as a jitney bus. It was her social life. She never had a "party" in all her nearly seventeen years—wouldn't have one; but she never drove a block in her life that she didn't begin to fill the car with pick-ups! Everybody rode with Mary White—white and black, old and young, rich and poor, men and women. She like nothing better than to fill the car with long- legged High School boys and an occasional girl, and parade the town. She never had a "date," nor went to a dance, except once with her brother Bill, and the "boy proposition" didn't interest her—yet. But young people—great spring-breaking, varnish-cracking, fender-bending, door-sagging carloads of "kids"—gave her great pleasure. Her zests were keen. But the most fun she ever had in her life was acting as chairman of the committee that got up the big turkey dinner for the poor folks at the county home; scores of pies, gallons of slaw, jam, cakes, preserves, oranges, and a wilderness of turkey were loaded into the car and taken to the county home. And, being of a practical turn of mind, she risked her own Christmas dinner to see that the poor folks actually got it all. Not that she was a cynic; she just disliked to tempt folks. While there, she found a blind colored uncle, very old, who could do nothing but make rag rugs, and she rustled up from her school friends rags enough to keep him busy for a season. The last engagement she tried to make was to take the guests at the county home out for a car ride. And the last endeavor of her life was to try to get a rest room for colored girls in the High School. She found one girl reading in the toilet, because there was no better place for a colored girl to loaf, and it inflamed her sense of injustice and she became a nagging harpy to those who she thought could remedy the evil. The poor she always had with her and was glad of it. She hungered and thirsted for righteousness; and was the most impious creature in the world. She joined the church without consulting her parents, not particularly for her soul's good. She never had a thrill of piety in her life, and would have hooted at a "testimony." But even as a little child, she felt the church was an agency for helping people to more of life's abundance, and she wanted to help. She never wanted help for herself. Clothes meant little to her. It was a fight to get a new rig on her; but eventually a harder fight to get it off. She never wore a jewel and had no ring but her High School class ring and never asked for anything but a wrist watch. She refused to have her hair up, though she was nearly seventeen. "Mother," she protested," you don't know how much I get by with, in my braided pigtails, that I could not with my hair up." Above every other passion of her life was her passion not to grow up, to be a child. The tomboy in her, which was big, seemed loath to be put away forever in skirts. She was a Peter Pan who refused to grow up. Her funeral yesterday at the Congregational Church was as she would have wished it; no singing, no flowers except the big bunch of red roses from her brother Bill's Harvard classmen—heavens, how proud that would have made her!—and the red roses from the Gazette forces, in vases, at her head and feet. A short prayer: Paul's beautiful essay on "Love" from the Thirteenth Chapter of First Corinthians; some remarks about her democratic spirit by her friend, John H. J. Rice, pastor and police judge, which she would have deprecated if she could; a prayer sent down for her by her friend Carl Nau; and, opening the service, the slow, poignant movement from Beethoven's Moonlight Sonata, which she loved; and closing the service a cutting from the joyously melancholy first movement of Tchaikovsky's Pathetic Symphony, which she liked to hear, in certain moods, on the phonograph, then the Lord's Prayer by her friends in High School. For her pallbearers only her friends were chosen: her Latin teacher, W. L. Holtz; her High School principal, Rice Brown; her doctor, Frank Foncannon; her friend, W. W. Finney; her pal at the Gazette office, Walter Hughes; and her brother Bill. It would have made her smile to know that her friend, Charley O'Brien, the traffic cop had been transferred from Sixth and Commercial to the corner near the church to direct her friends who came to bid her good-by. A rift in the clouds in a gray day threw a shaft of sunlight upon her coffin as her nervous, energetic little body sank to its last sleep. But the soul of her, the glowing, gorgeous, fervent soul of her, surely was flaming in eager joy upon some other dawn.